Sam Rockwell has distinguished himself as a top actor and he has done a wide array of genres. From the first Charlie's Angels to the dreadful A Hitchhiker's Guide To The Galaxy to Matchstick Men and now to one of his most difficult performances to date in this dark thriller - A Single Shot. Rockwell plays John Moon, a down on his luck West Virginia mountain man whose wife has just left him with his newborn son. To seek peace and solitude, John goes hunting and while shooting at a deer, he accidentally shoots and kills a girls hiding in the woods. Upon realizing his horrible mistake, he finds she has been living in an abandoned container trailer and is hiding out from someone and has apparently stolen a nice chunk of change. Moon takes the money and tries to patch things up with his wife and child, but still hires a divorce attorney played by William H. Macy. It is then when John starts to get threatening phone calls, and cars start doing drive byes. Since he lives out in the middle of nowhere, Moon starts to get understandably suspicious. He starts to suspect everyone, even people he has know his entire life. Some with good reason, too. Rockwell totally submerges himself as Moon. It is the only way you could sell a character and a performance like Rockwell as Moon, He is a somewhat grouchy moody man who is always in thought about something. Yet, as despicable actions as he commits, there was still something human about the man so I was invested in the character. Is A Single Shot a great film? No. But it has great performances from Macy, Jason Isaacs as the town thug, Waylon, Joe Anderson (The Crazies) as Obadiah, Waylon's partner in crime, Kelly Reilly is sweet as Moon's wife and Ted Levine makes the most of a smaller role as Cecile, a friend of Moon who offers him a job. Ophelia Lovibond is radiant as Abbie, Cecile's daughter who is quite smitten with Moon, and Jeffery Wright is Simon, who may or may not be Moon's friend. The acting is excellent from everyone, however if I had to do anything different I would have cast all of the parts by relative unknowns. Most of the cast playing country folk are British, with the exceptions of Rockwell, Levine and Wright. There is nothing wrong with that but I spent most of the film noticing who the actors were and then relating it to their parts, instead of totally immersing myself in the characters and their dilemmas. Still, David Rosenthal's solid direction and Matthew F. Jones's script based on his novel has enough mystery and character development that I was entertained by the film and cared what happened to the characters. 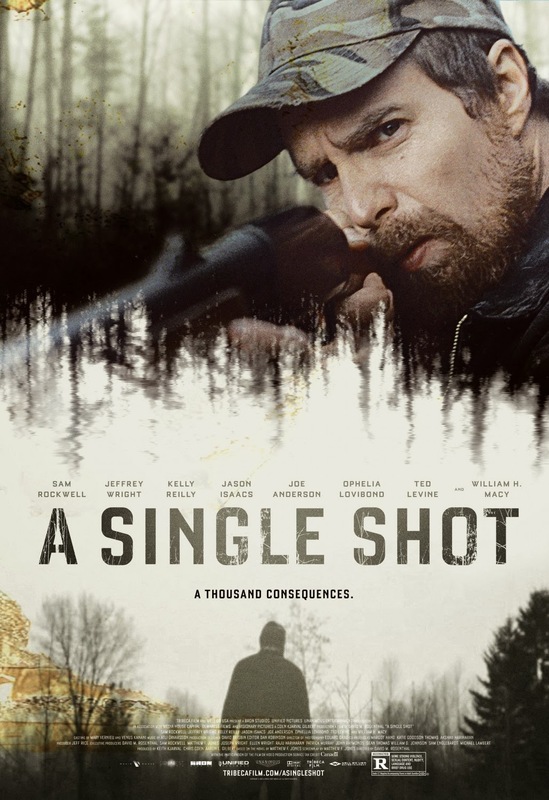 A Single Shot is a tough film to watch. It is dark and ominous throughout and Icelandic composer, Atli Orvarsson's score is primarily strings that are screeching signifying the emotional strain the main character is under. Will he do the right thing? How is he going to get out of the predicament he has put himself in? On those terms? Good Breakdown of A Single Shot! You Spot on about the movie. Thanks JohnnyTwoToes! Can't wait to read more of your reviews. Thank you Chuck!! I will keep them coming!! !